How to correctly operate impact crusher in stone crushing plant? NewsHome > News > How to correctly operate impact crusher in stone crushing plant? Before Impact crusher driving, we had better check all lubricating points, whether there is enough grease, connecting bolts must be fastened, each parts must tighten airtight, check the clearance between the rotor plate hammer and impact plate,whether it is appropriate, rotating the rotor with the hand, it should be no jam and collision phenomenon as well as should be able to light.Great Wall Company introduces some operation tips for you to correctly operate impact crusher in stone crushing plant. 1, After start the motor, we should be sure to wait for a properly functioning, and then begin to uniform loading into impact crusher crushing cavity. 2, When we stop impact crusher,we must stop feeding materials, until all materials are crushed in crushing cavity and they are discharged out,we can stop impact crusher motor. 3, Regular check plate hammer wear condition and change it in time so as to avoid damage on rotor, After changing the plate hammer replacement, we shall do static balance calibration for impact crusher. 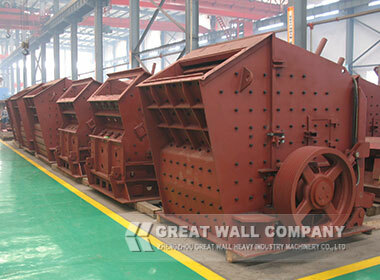 Previous: What are detailed works for jaw crusher inspection and maintenance?